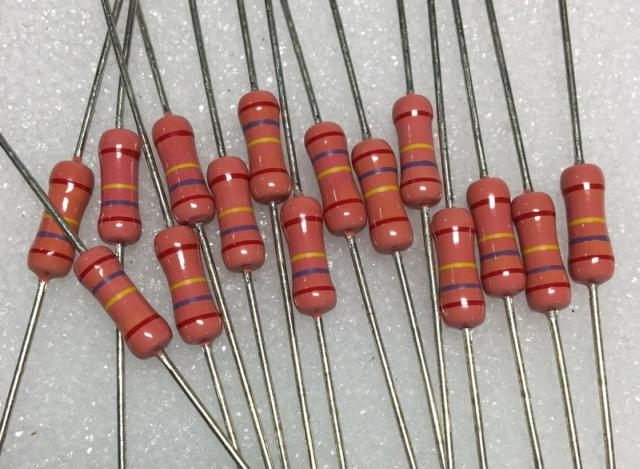 I have some resistor pictures but they are not G rated. 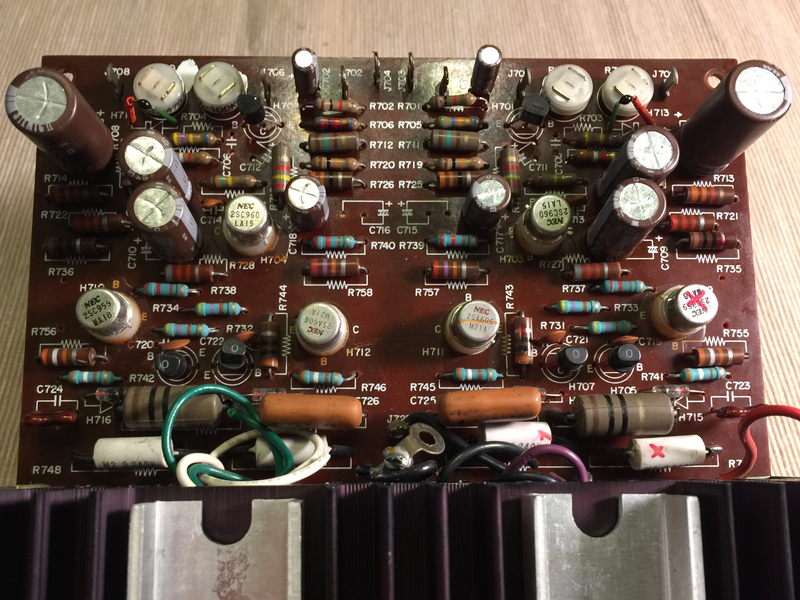 This old Krell KSL pre with phono board had a few caps. Well, yeah, maybe -- but I am not sure I'd want my signal goin' through all of that stuff on any given day. 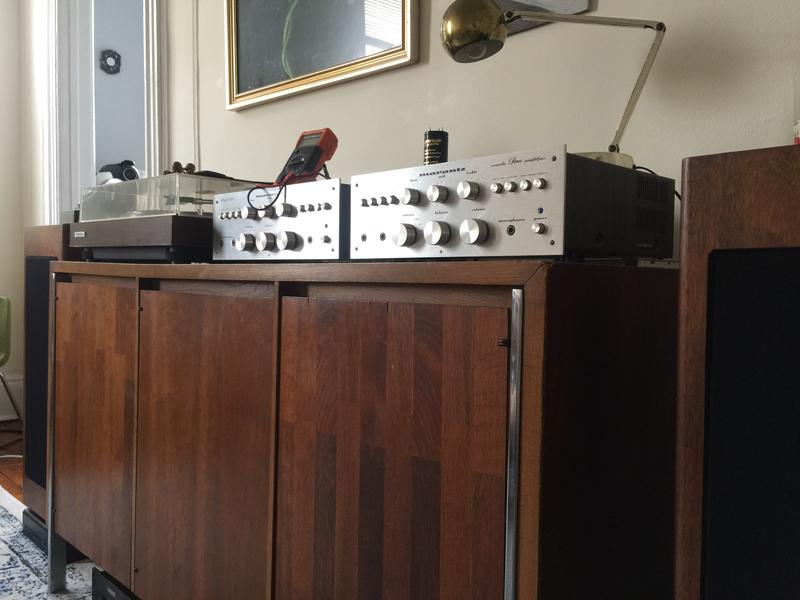 I bought that Krell from Rich, it's my daily driver! 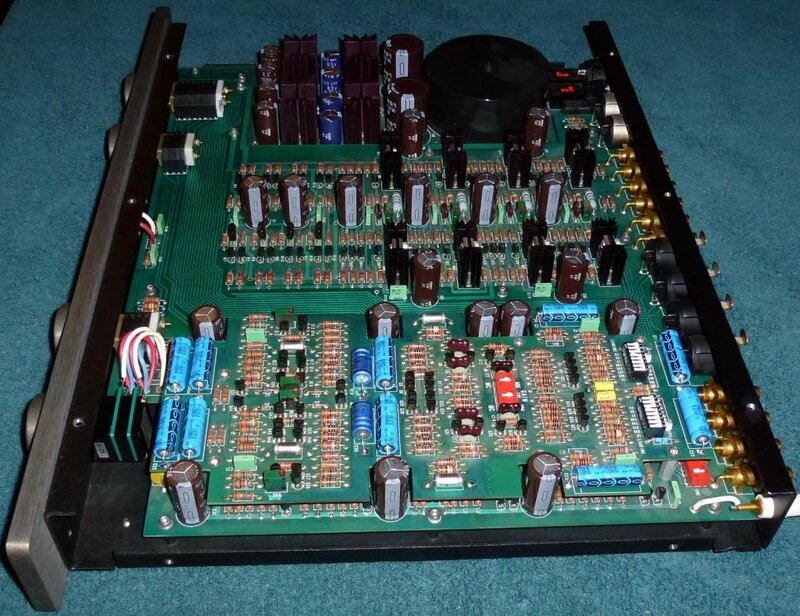 My ears tell me it's the best of the small preamp stable I own (see signature). I agree! 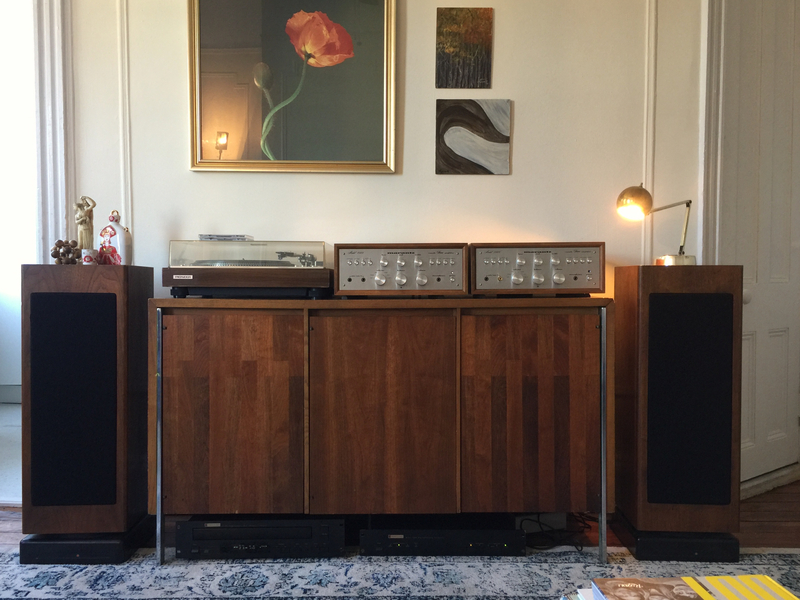 The phono stage isn't bad at all either. Got the second unit in! It has an earlier serial number and looks pretty clean inside. I have opened up the same thread on AK and the peeps there will guide on this one. My knowledge is limited when it goes beyond checking values and replace parts. 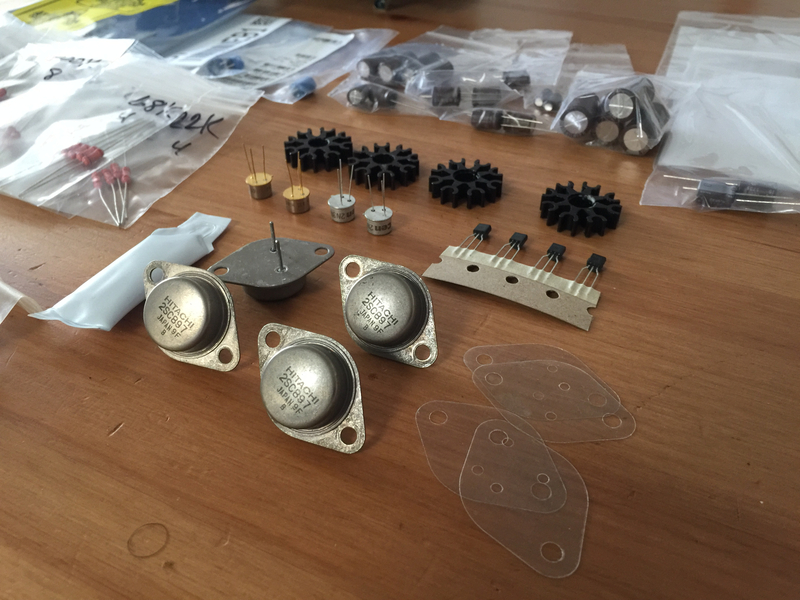 My cap order is on the way, first I'll replace power supply first electrolytic , main amp electrolytic coupling caps and main filter. 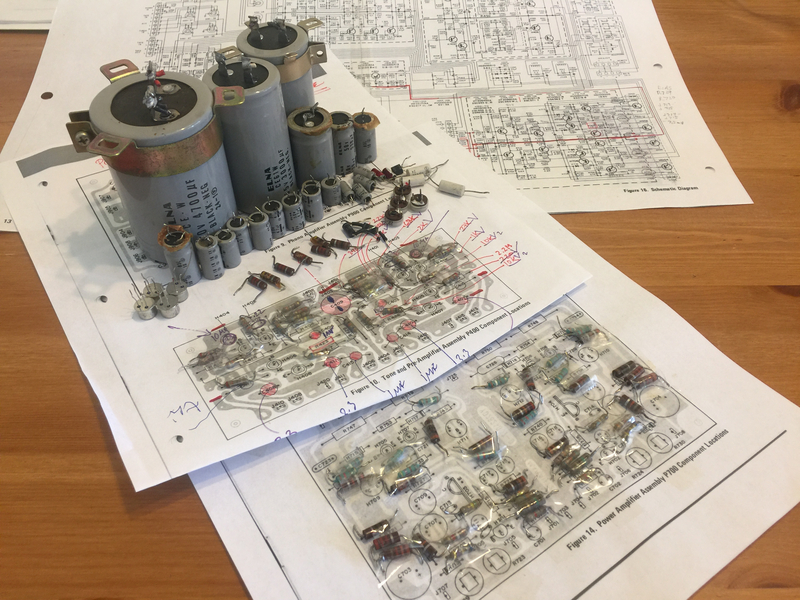 If problem persists I will move on transistors and diodes. Any tips here would be appreciated as well. 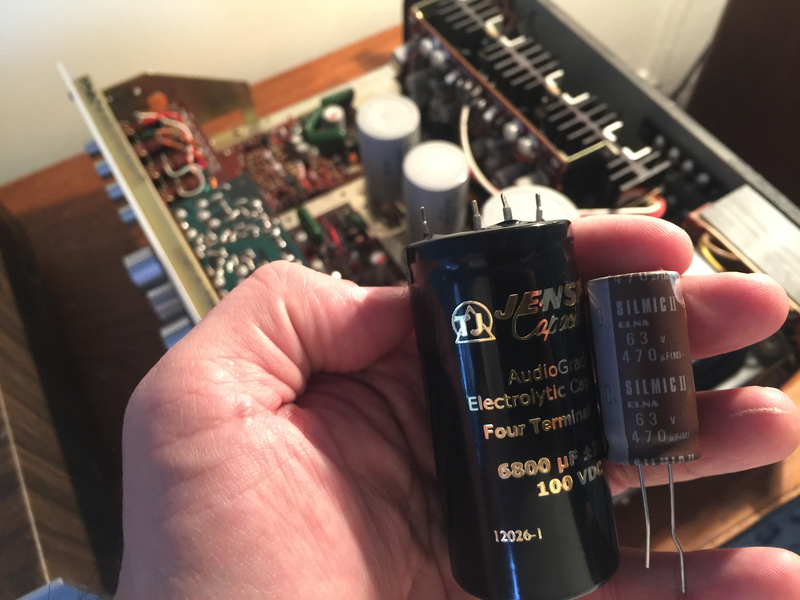 just thought I should share this list of common transistors found in vintage audio and their modern day substitution, always pay attention the pins layout as this may very. 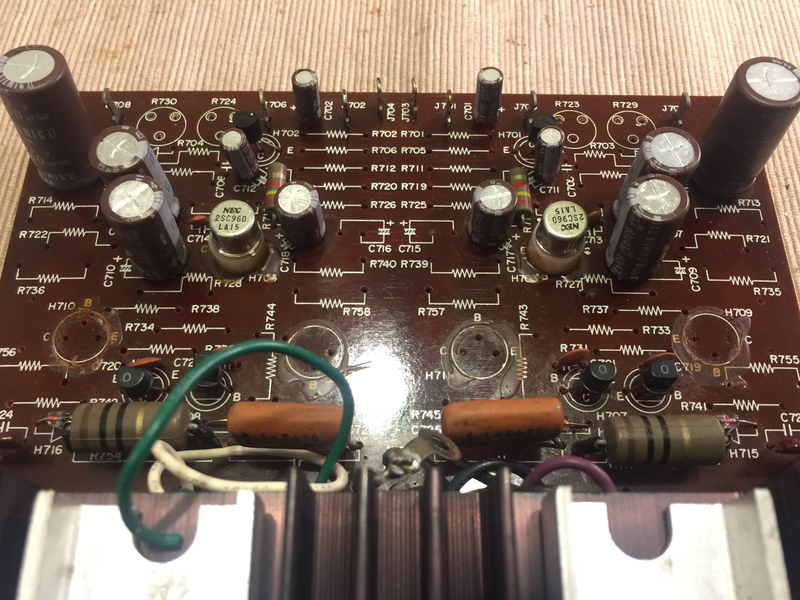 Came across this useful list when was looking for replacements for a few transistor on the power board that may be responsible for the right channel issue. also resistor R747 and R749 (0.24ohm 2W wire wound) will replace with mills. 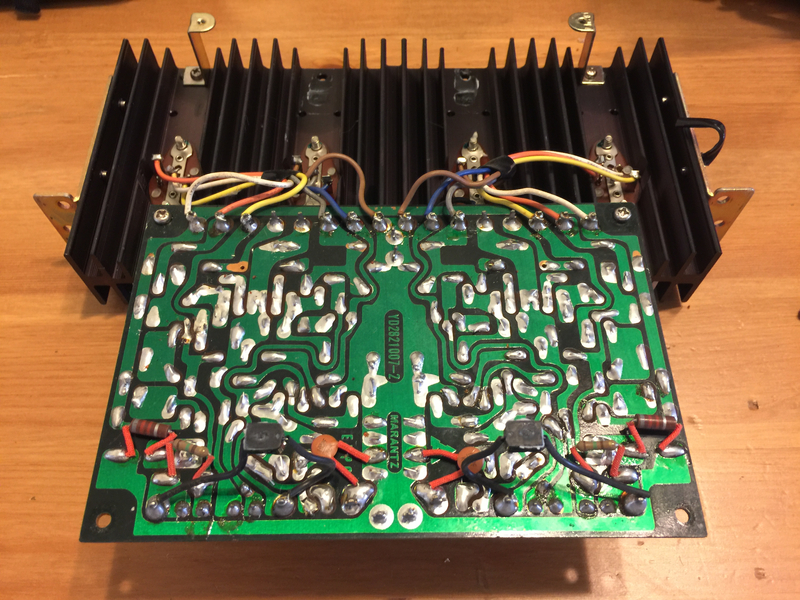 Power amp board came out today, easy to disconnect. 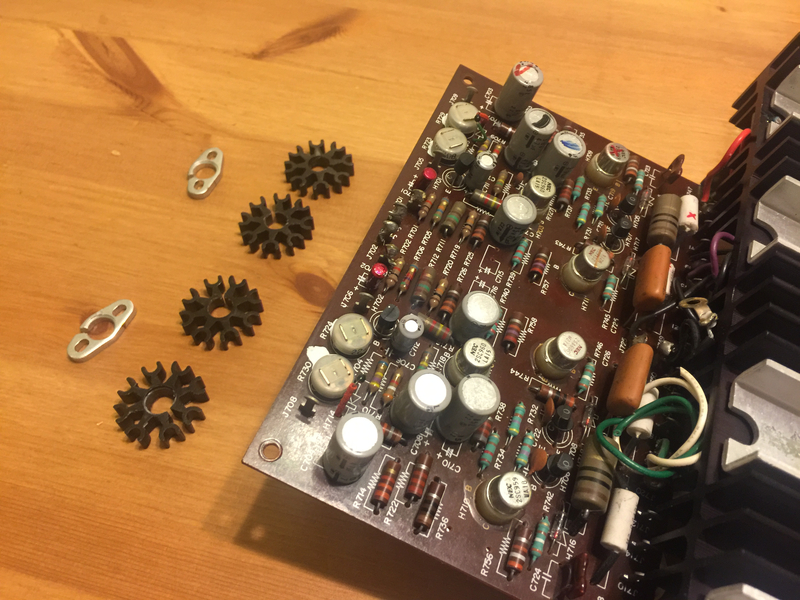 The whole module With heatsink came off. 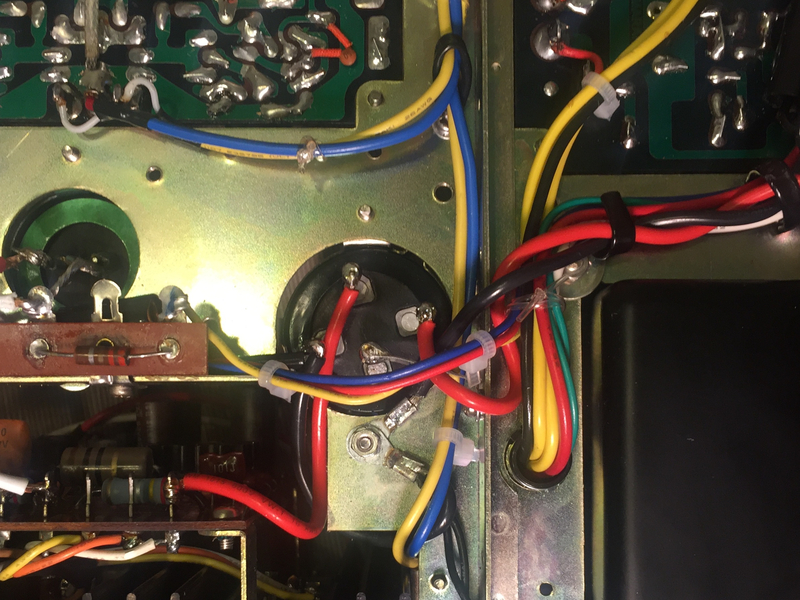 I only had to unscrew it from chassis, disconnect the shielded audio cable that brings the L-R signal from preamp, power supply line from main filter, separate coupling caps and ground connection. These orinsl wire will be redone with new and heavier gauge wire. The caps will get replaced as well. I will use 6800uf Jensen 4 pole instead of the 4700uf big filter and 2 Mundorf mlytics will take the place of the original 3000uf output coupling cap. It’s important to document everything with pictures and notes, and this thread will help to review work as well. 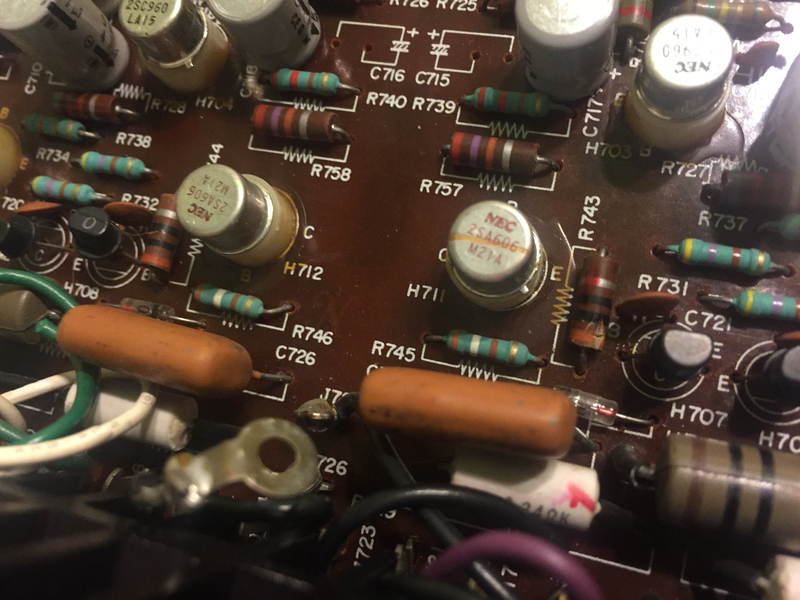 I have made a few more measurements today and probably found the cause of the channel imbalance, resistor R743 measures more than twice its value!! 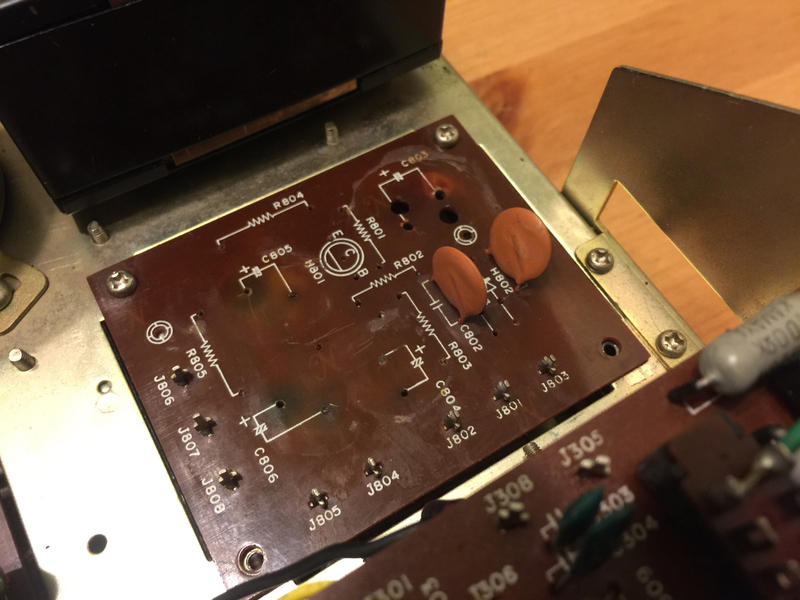 There are also other small discrepancies between L and R channel actual resistors readings. This reiterates how important his to overhaul a vintage unit if it’s intended to use it everyday and there’s no “collectors” value or interest. I finaly stoped procrastinating and did the power supply. Everything came with the exception of the ceramic caps. 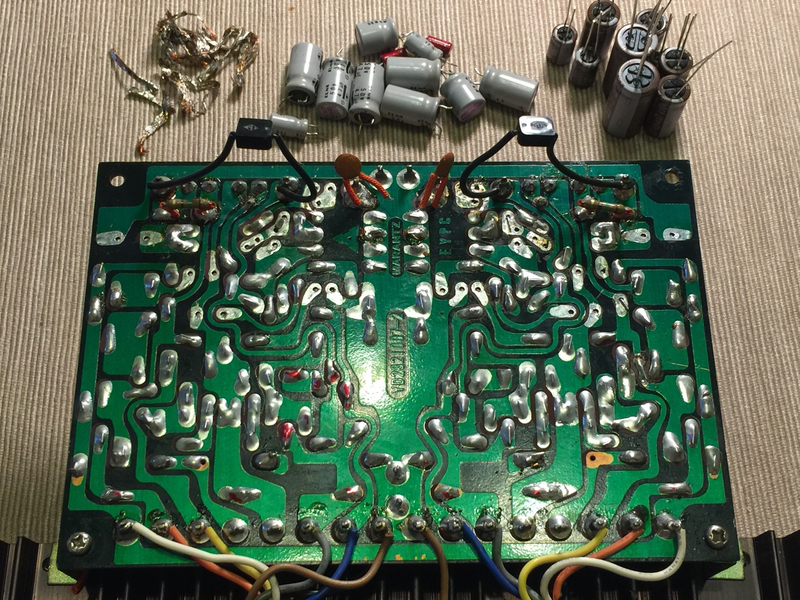 All electrolitycs, carbon comp resistors and transistor were replaced with modern audio grade parts. 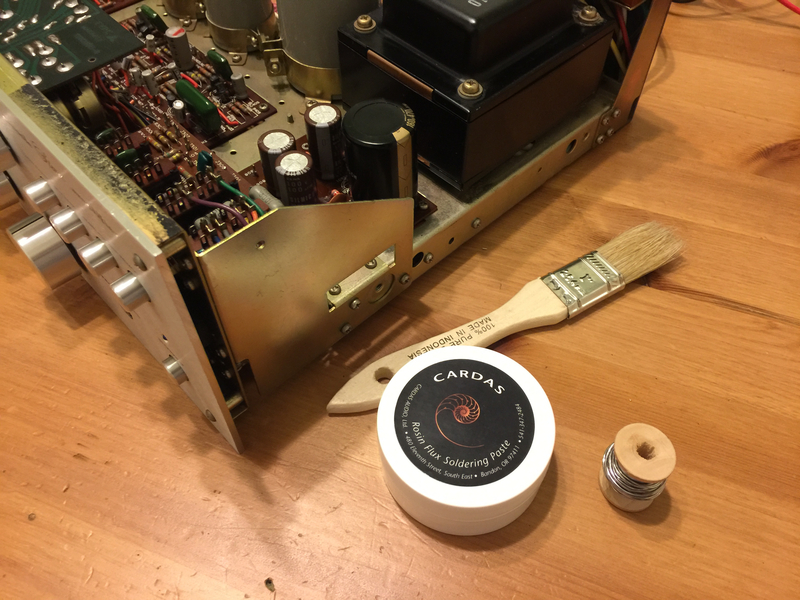 I have respected the original values, however some folks recommend bumping up capacitance. 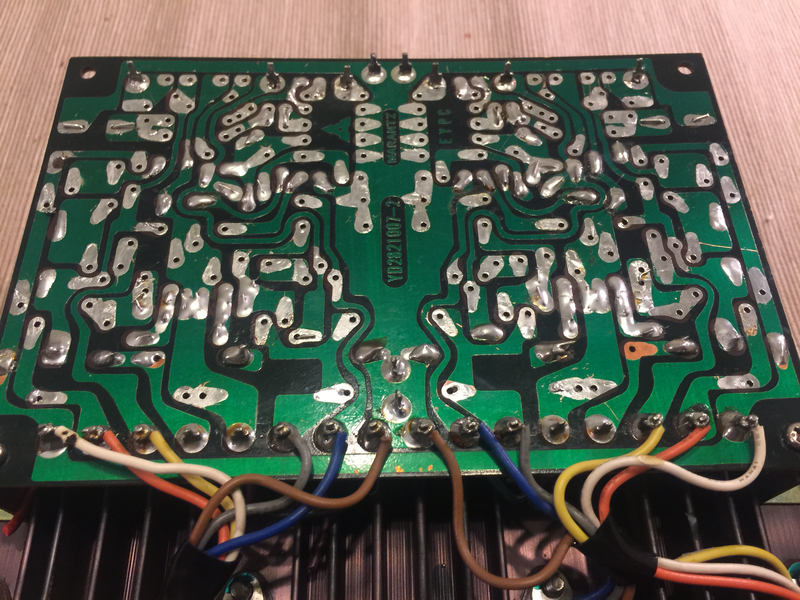 I recommend good desoldering braid, flux paste and solder, I have use cardas. Makes the process fast avoiding heating up the components excessively. 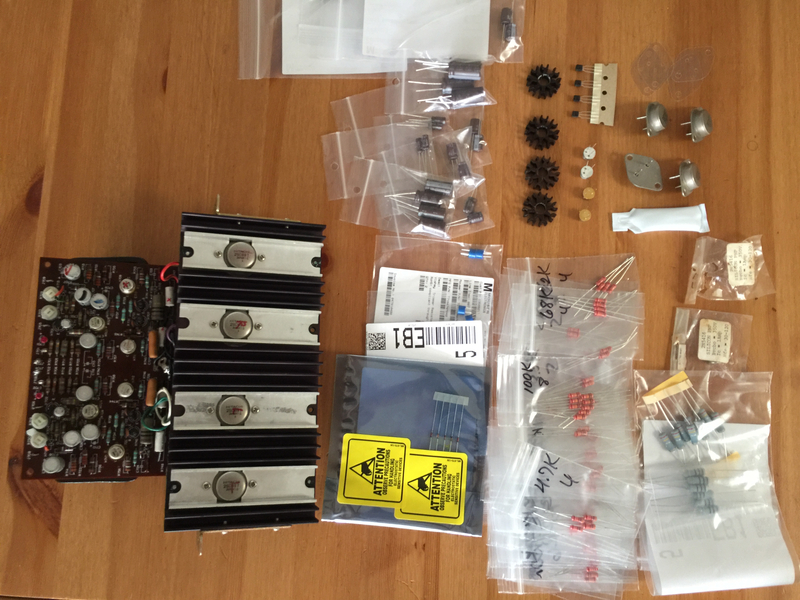 Going to jump on the main amp, got all parts in. 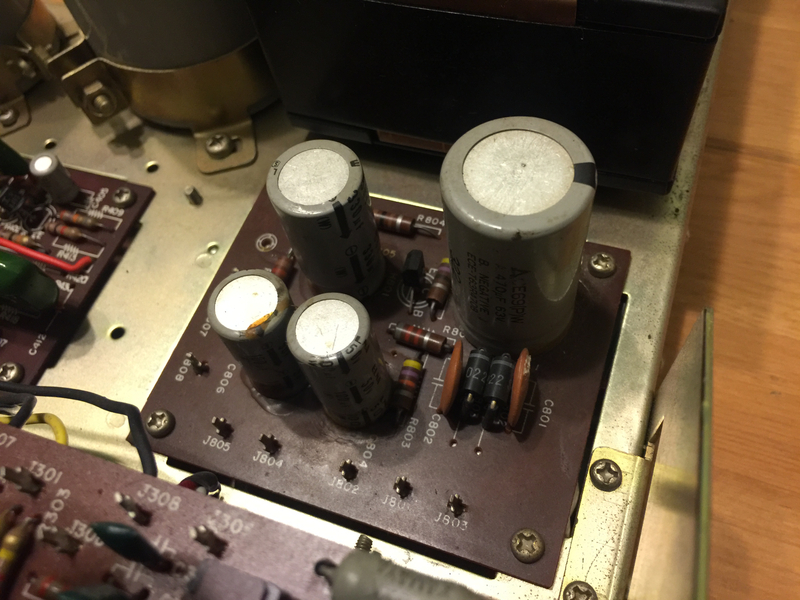 Existing silver mica, film and ceramic capacitors will stay in. 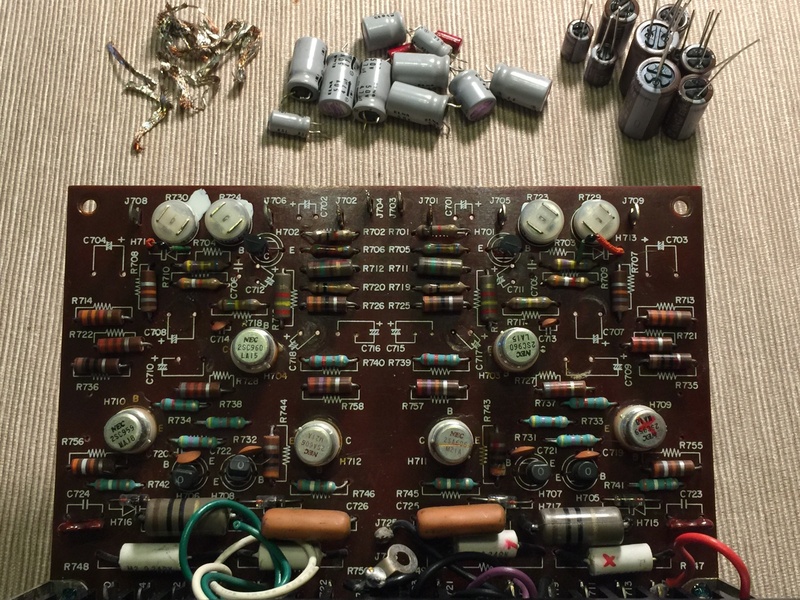 I was happy to source original output transistors to replace the bad ones. 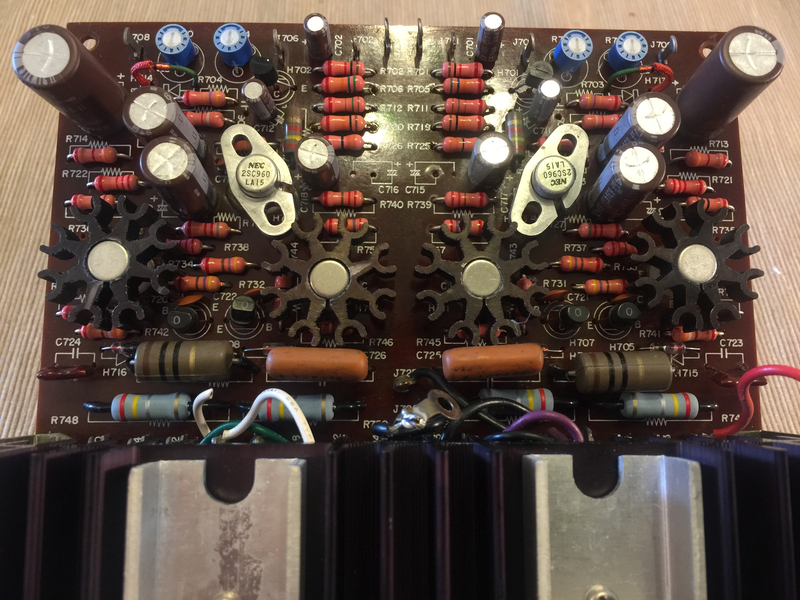 Power amp done, moving on to main filter and coupling caps. Looking very good, above & below deck! Thanks guys, I am getting closer to the first power up, getti Nervous!! Some Variacs have built-in voltmeters (which is handy but not mission critical); some (probably?) have built-in ammeters. 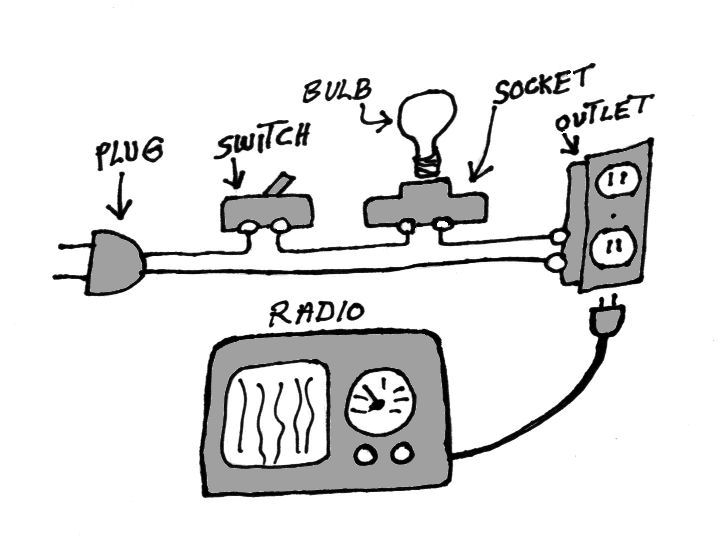 An ammeter would be nice to have... but (cheap m-of-o I am) I make do with a "Kill-a-Watt" plugged into the Variac's outlet (with the load then plugged into the Kill-a-Watt). 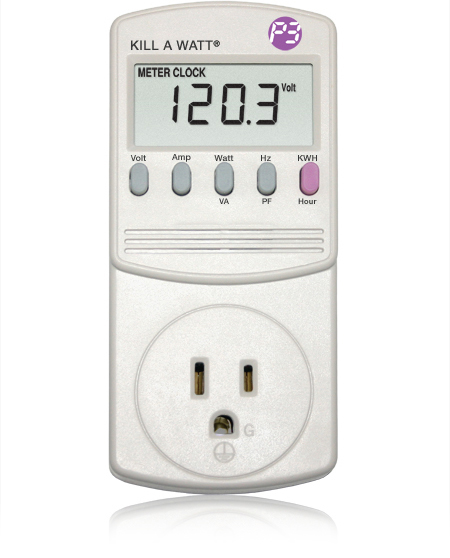 If you don't have a Kill-a-Watt, it's a wicked handy little gizmo that can measure AC line voltage, power draw (watts or VA), power factor, and line voltage and frequency. Of course, we're not talking NIST-traceable lab-grade precision or accuracy, but a good tool to get basic info. The current draw function I've found particularly useful for troubleshooting. 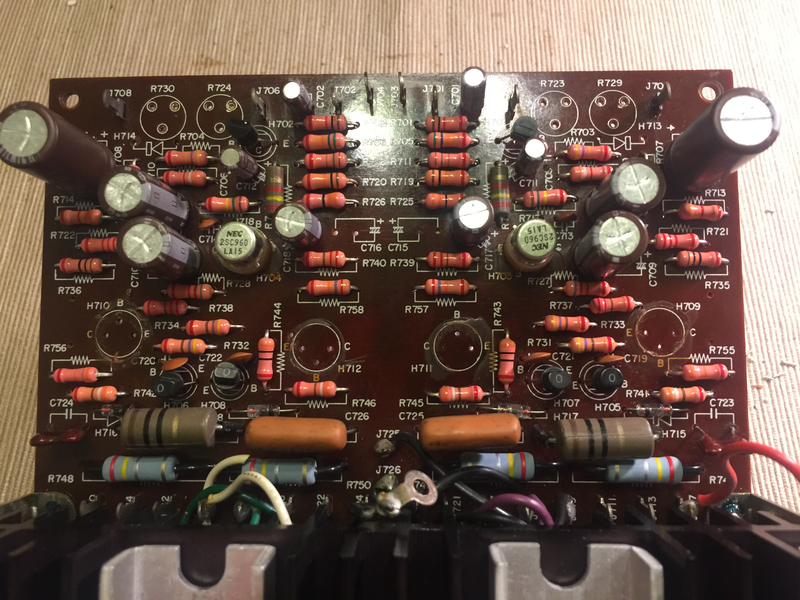 so -- not to flog this topic unnecessarily (i.e., pointlessly) but here's another option for a similarly useful gizmo for repair/troubleshooting. 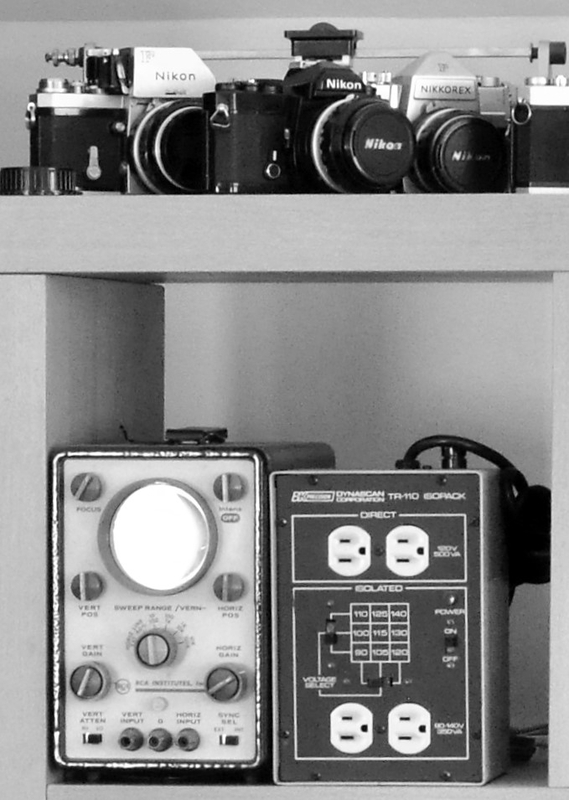 The little box on the right is a B&K/Precision Instruments TR-110 "Isopak". 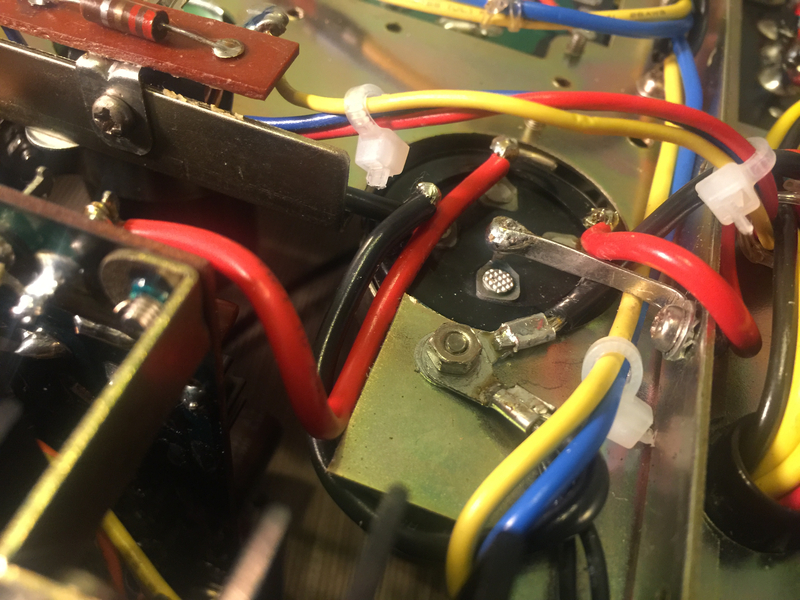 It contains an "isolation transformer" (1:1 transformer to isolate a component under test/repair from the AC mains) that also has taps to give several other (lower) AC input voltages. of isolation from the AC mains that a Variac does not. 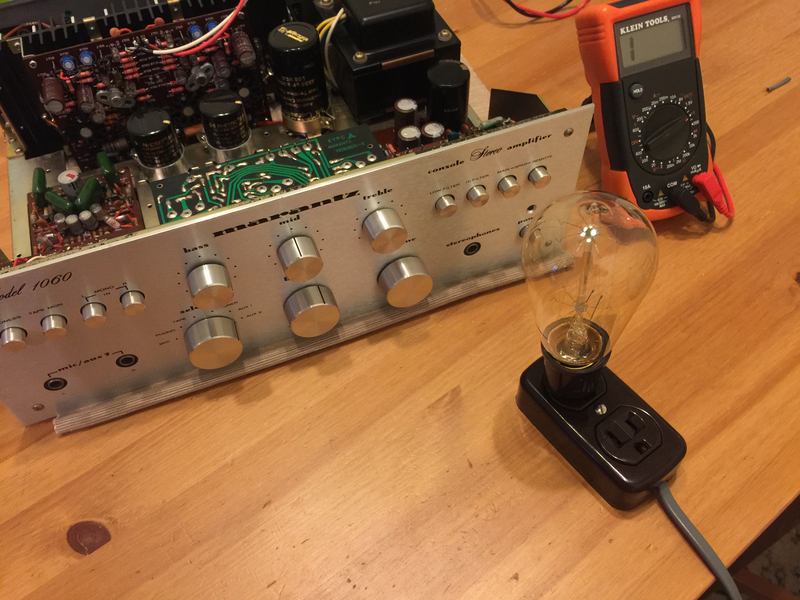 The isolation is a pretty important safety component on the rare (for hifi tinkerers!) 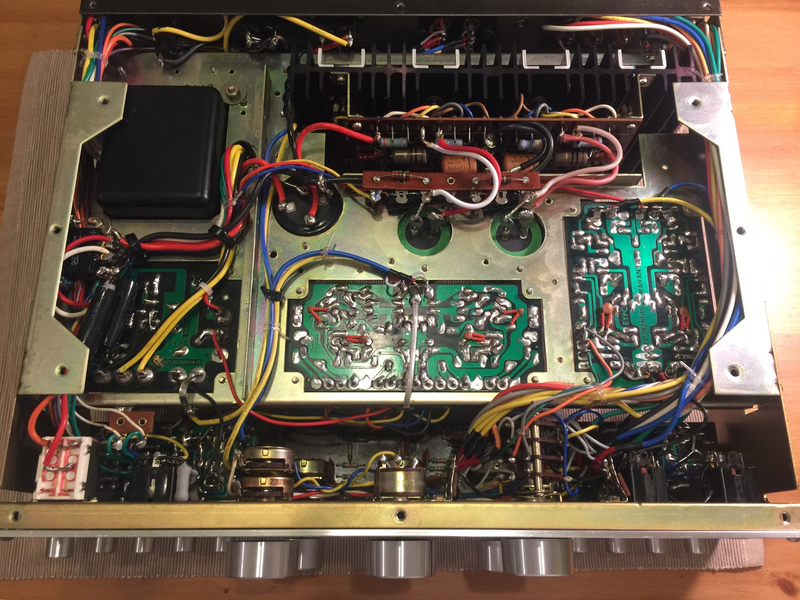 occasion of a power transformerless, so called "AC-DC" or "Series String" killer chassis! 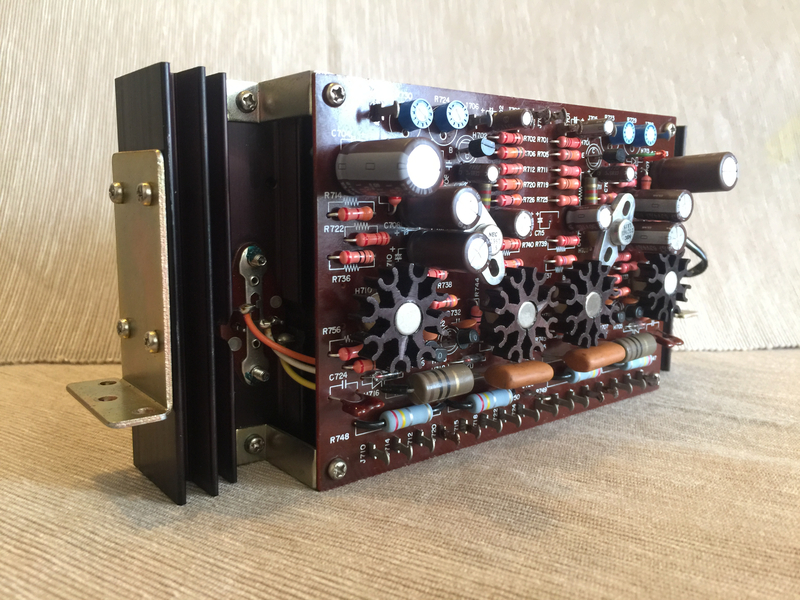 These were ubiquitous in tube AM table radios of the 1940s to early 1960s (the so-called "All American Five" five tube series string circuit!) but were also sometimes found in cheap hifi mono and stereo phonograph and console radios or stereos. 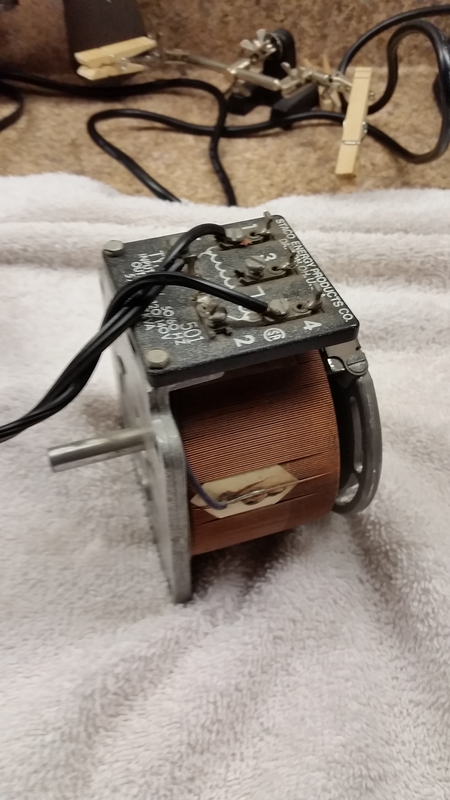 With no power transformers on board, these could, depending upon which "sense" the nonpolarized power cord was plugged in, could put the AC mains voltage (120 VAC, give or take) onto the chassis of the radio/console! Not a good thing, especially for someone working on the components. Thanks, mhardy6647 for your direction. 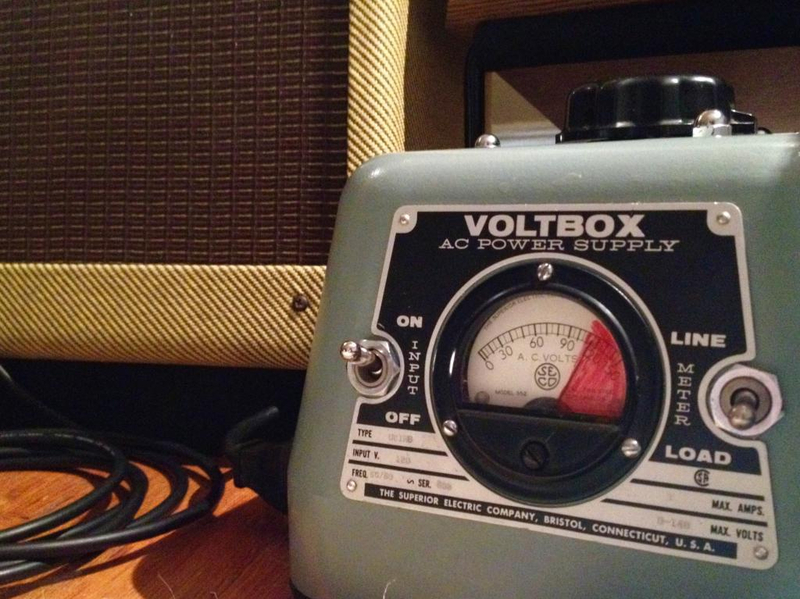 I just recall that I had used to have a variac I used with a guitar amp... stupid me to get rid of it. Ok, The 4 pole Jensen are bit trickier to wire than a regular cap. "The basic idea it to separate the input and output lines of the electrolytic. As you can see below, the 4 poles has their own function. It has 2 Input poles and 2 Output poles, each has their own positive and negative pole. 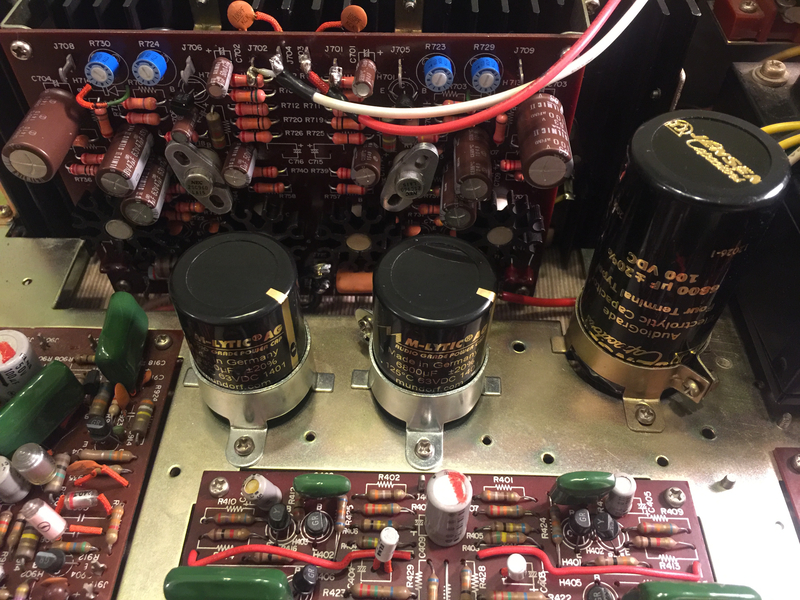 So by using this capacitor, we will create virtual separation between input side and output side – as if we are having 2 capacitors connected in parallel." Supposedly, the 4-pole will kick the amp a few notches provided with a natural smooth sound, a darker background is darker wider staging... when compared with a M-Lytic which is already great. Just built a dim bulb tester for the first power, I’ll be using a 60W bulb. 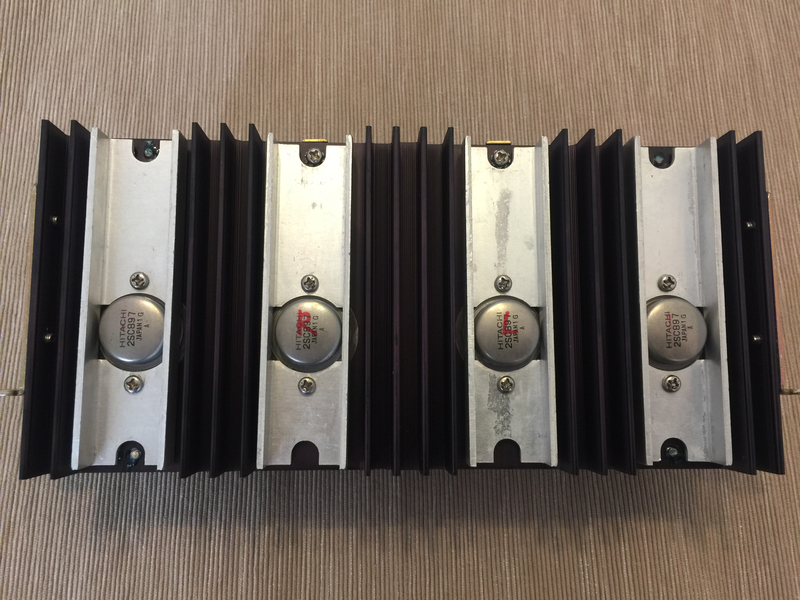 Any idea on the best build wattage for a 30w amp? 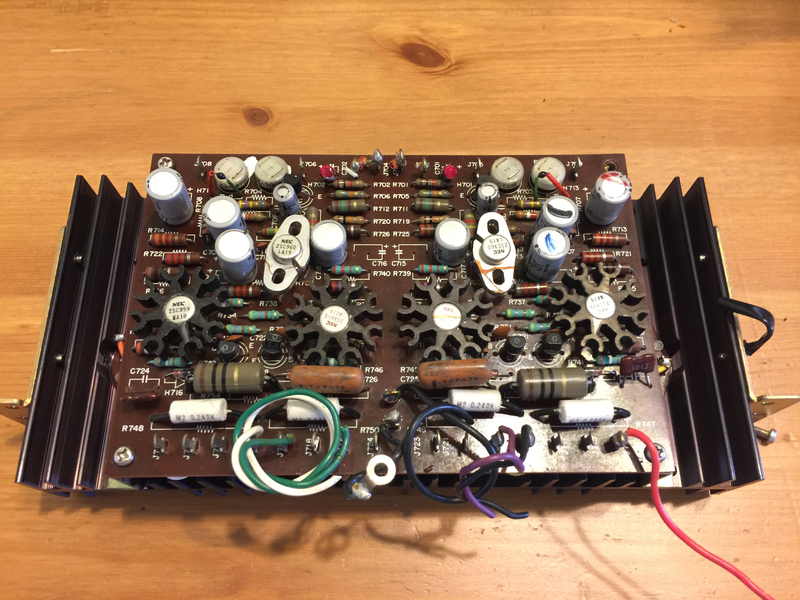 I used this when I rebuilt my Hafler amp. Surplus from work and needs a case. First power up went relatively well. Dim bulb tester was useful and did its job, It lighted up with inrush current and dimmed out. It would remain lit in the event of anything was shorted. 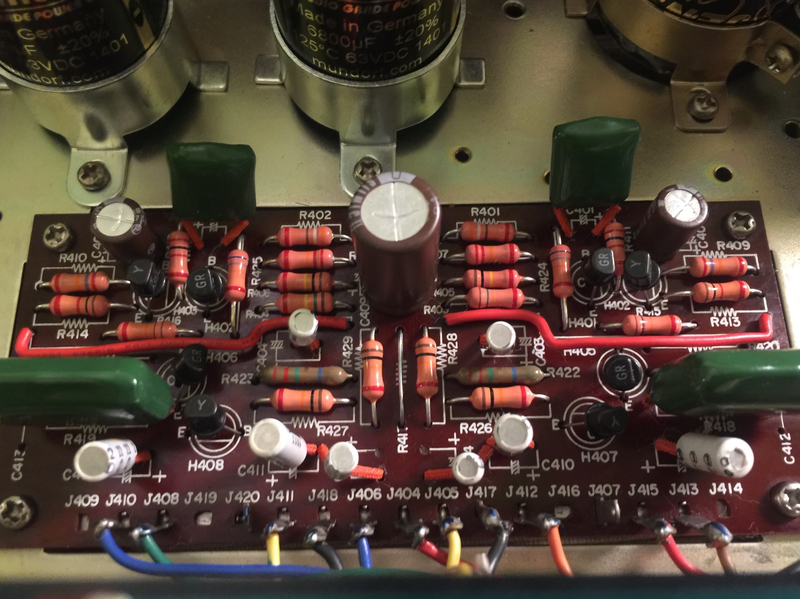 -Bias voltage and clipping voltage is set to spec. -The sound is pretty good out of the bat with headphones. -Right channel distortion and unbalance is eliminated. -VDC readings are symmetrical on both channels.
. Maybe a different combination will help with the taper. 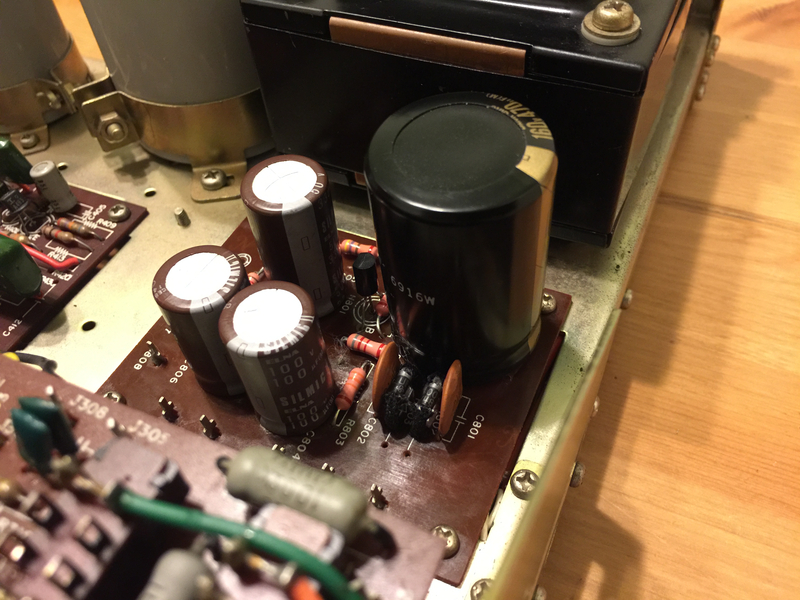 -Noticed a hum that is not affected by volume knob or any other control, it seems to float in the background. It disappears when the jumper from preamp to main in is unplugged. When music volume goes up the hum goes unnoticed. This is weird because my other stock 1060 is dead silent. I suspected it may be a grounding issue and I am experimenting with different lead dressings, this seems to reduce it significantly. -Takman REX carbon film resistor. 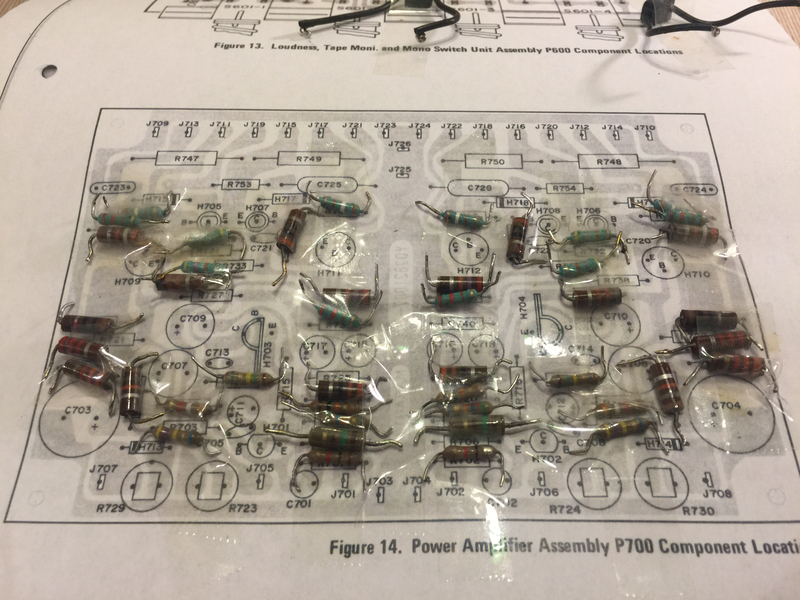 Although, I have to say that all existing resistors measured as per specification. The original green Nissei films were left alone. 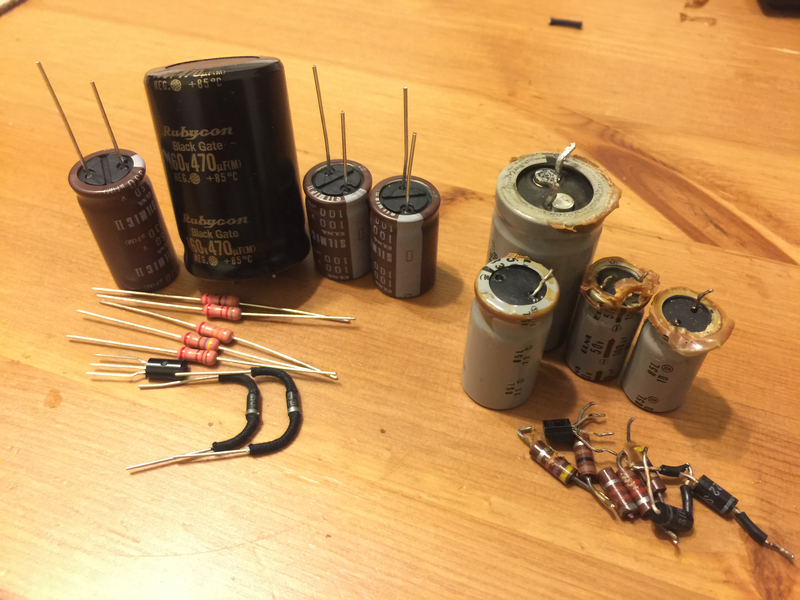 It's recommended to replace the small value caps with film capacitor. I have opted to leave the original in, for now, I am not set in a replacement cap choice yet. Is it that or is it a really dirty/bad pot? I mention this because if the latter, one does run some risk of a catastrophic loss of bias (i.e., with a 'scratchy' pot) which could have... other deleterious effects. 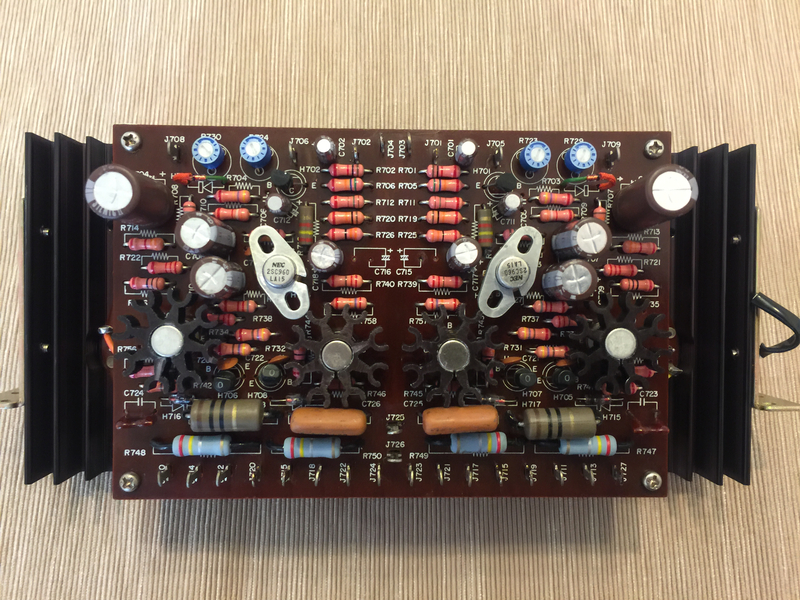 At least, I reckon that could happen -- it certainly can in the vacuum tube world. I hope it's just the pot taper in the region in which you need to adjust! 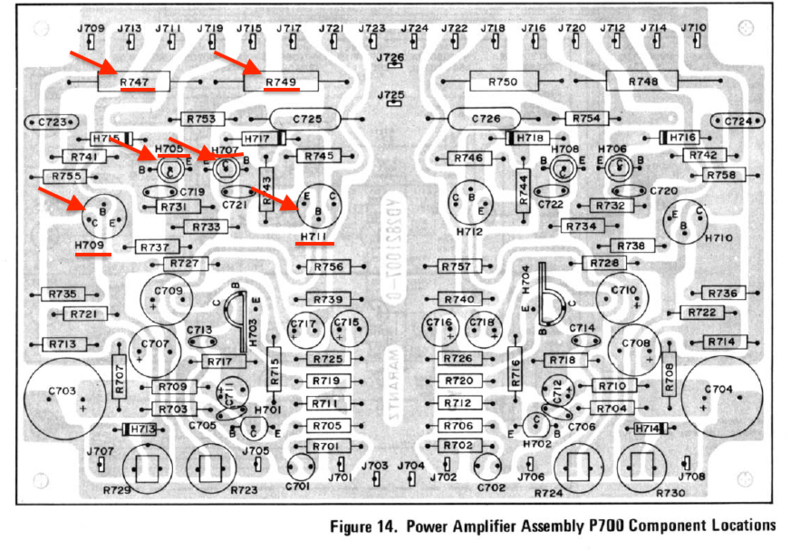 As to your hum -- sounds like a ground loop issue(?) 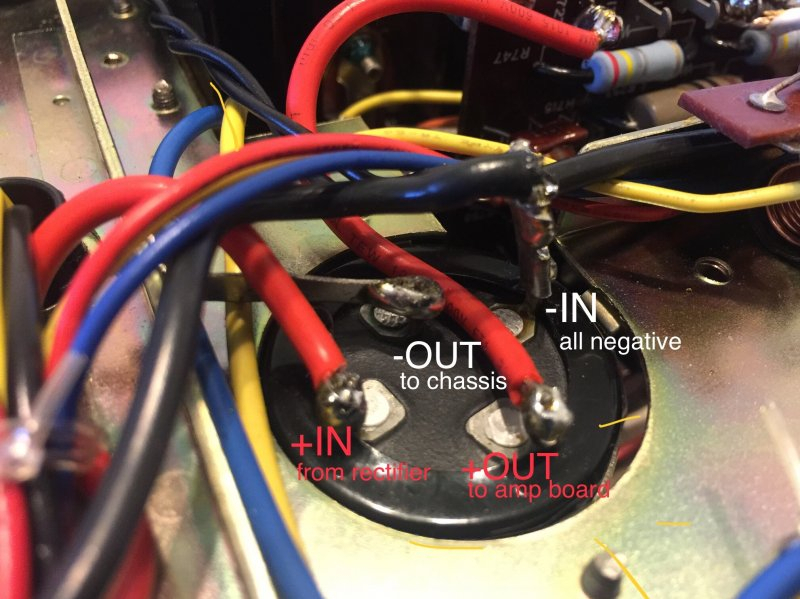 Did you try reversing the (nonpolarized) power cord on the amp in the AC mains socket? (or did you replace the cord with a polarized one?). The pots are new, they behave the same, it’s super sensitive, I regret not installing a multi turn style potentiometer. 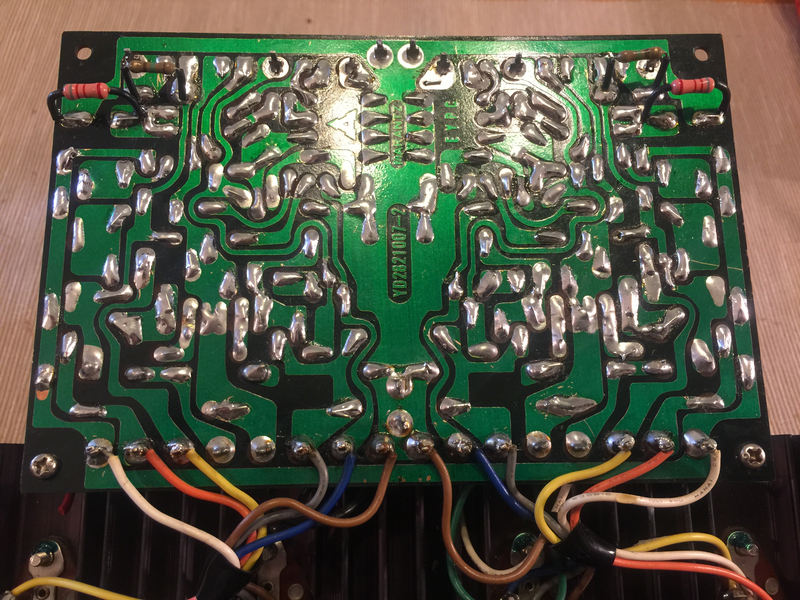 At this point I am almost sure that is a ground hum, not sure if I wire the 4 pole main cap negative leads well... it was also tested without metal covers. I have to do more testing. First conclusions will sound “cliche”, this little Model 1060 is sounding phenomenal to say the least!!! I haven’t AB it with the stock 1060 but couldn’t be happier. I notice an excelente frequency response, more sense of dimension with amazing defenition, any detail or nuance is lost on the material I am most familiar. 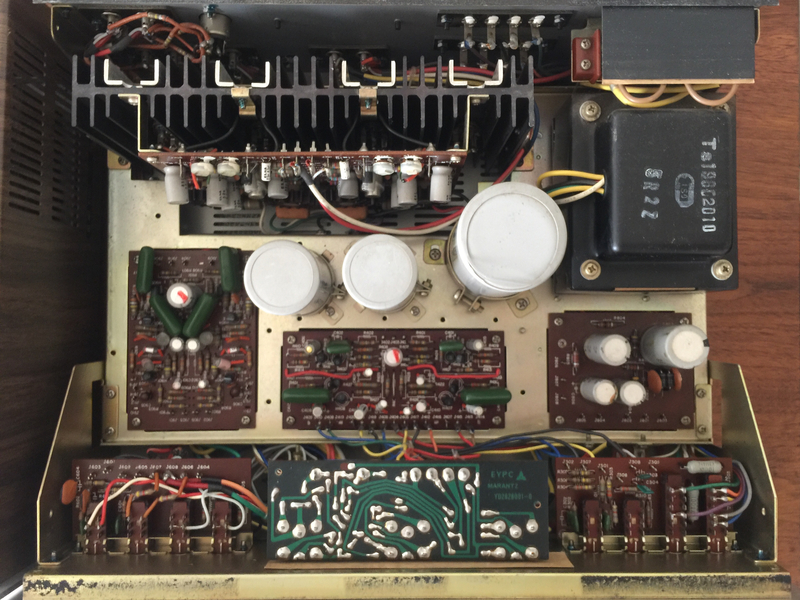 The typical smooth and envolving Marantz “thing” is still there, this is inherent to the design and not components. 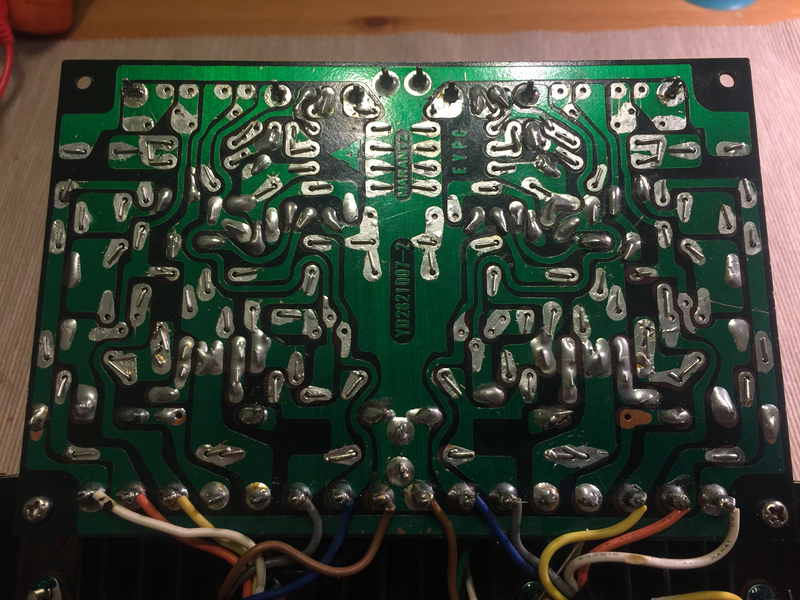 -The bias was difficult to adjust because I installed a 450K ohms bias potentiometers instead 450ohm, ah! rookie mistake. 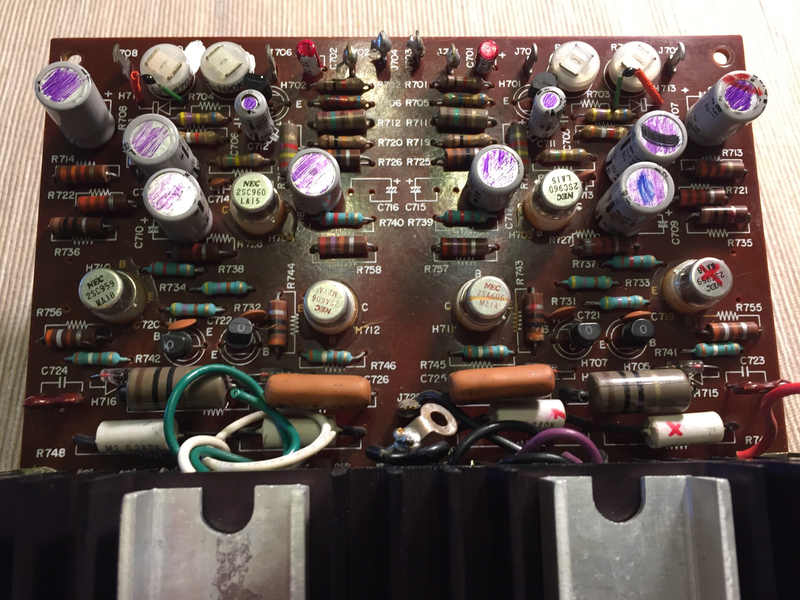 -The grounding noise is gone, the addition of a star ground resolved the issue. 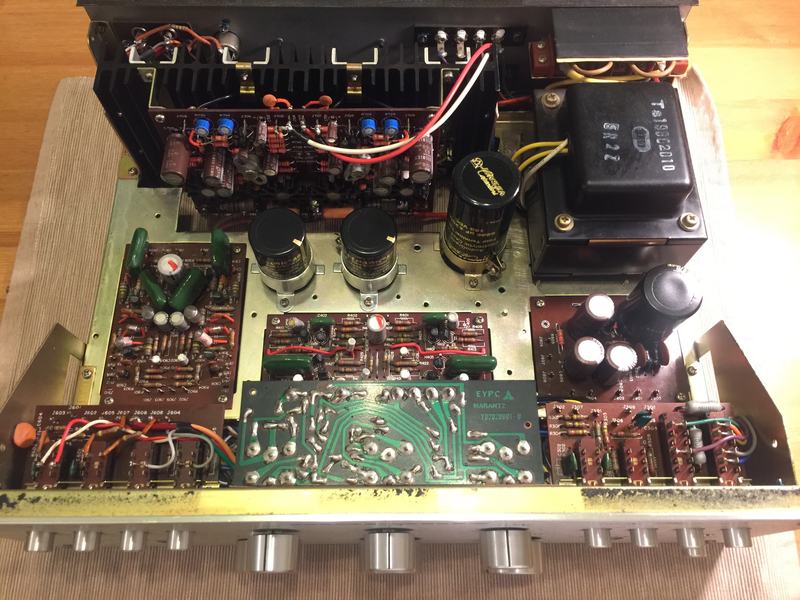 -Power amp: add flyback diodes, replace ceramic input caps with films, install correct bias trim-pots. 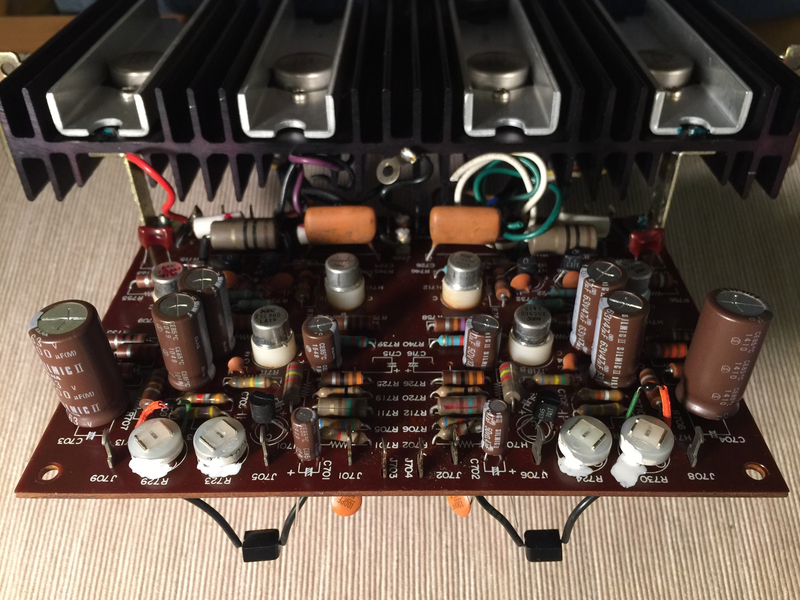 The amp has reached the 75-hour mar. The sound seems pretty much settled by now, although many say things will keep improving. I have listened to favorites tracks from the albums of Diana Krall, REM, Yo La Tengo, Pink Floyd, Kings of Convenience. 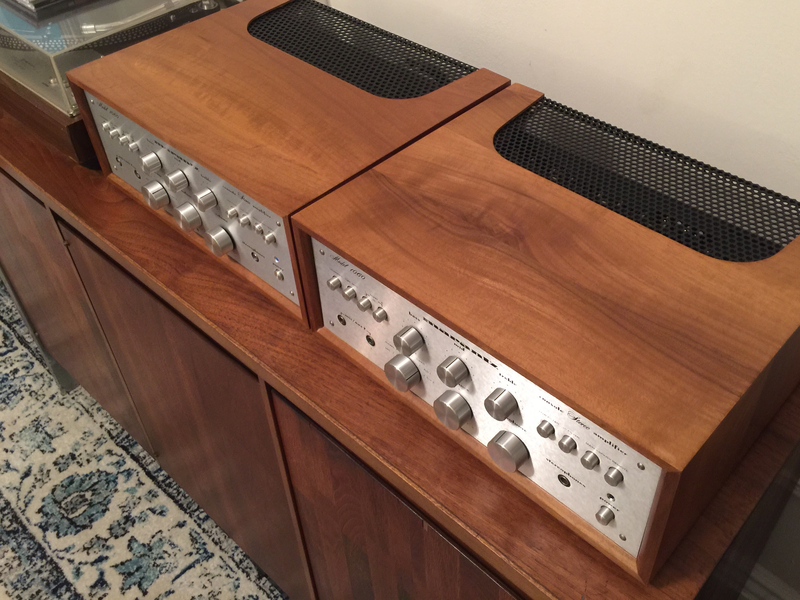 -Both amps keep the same voice, as known this is related to the design. -Music has a warm presentation, envolving and three-dimensional, the treble is smooth and never fatiguing. -The sound appears to focus between the speakers. -The soundstage is credible when speaker position and room size is ideal. - Better soundstage sense and instrument realism. - The decaying sound of the instruments sustains longer without blurring into the mix. Smooth sounding but a bit recessed. Typical treble instruments have definition and realism. Tone knob needs to compensate a bit past noon. Female voices sound really pleasant and warm. Probably a bit bloated, I have to kick back the tone knob to tame it a bit. Bass imprints a fat sense to the sound which some people like, I also had to kick back the tone knob one notch for a more balanced sound. Upper range instruments sound smooth and amazing realism. I notice independent instruments varying loudness levels more clearly, as I would expect to hear on a multi-figure high-end equipment. More details, glare, air without any harness. Mid-range is rendered very realistically without losing its warmth. The vocals definition is a quantum leap above, I can perfectly hear different voices in a chorus. Some recording space random sounds, like a chair sliding, clapping, breathing seem to be happing in my listening room or around the house without the fake gimmicks of surround sound systems.